The 1978 Lufthansa cash and jewel heist at John F. Kennedy Airport in New York is among the biggest heists in U.S. history. The robbers stole approximately $5 million in cash and $1 million in jewels from an airline cargo building. 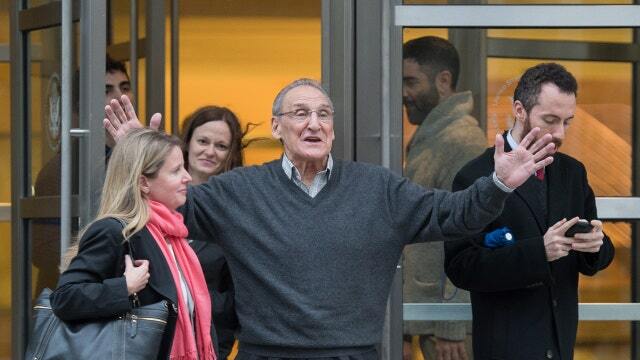 Vincent Asaro, who had been accused of assisting in the heist and served as inspiration for the film "Goodfellas," was acquitted of all charges Thursday. In 1990, two men in police garb stole 13 objects from the museum including paintings by Rembrandt, Degas and Vermeer. At the time, the heist was valued at $200 million ($500 million in today&apos;s dollars). The FBI posted a $5 million reward for the return of the paintings. The largest ever cash robbery in the U.S. happened in 1997 as an inside job. Allen Pace, a regional safety inspector for Dunbar, along with five friends, took over guards and loaded the loot of $18.9 million into a truck. The thieves were caught when one used some cash as the wrapping. Since then, the FBI, IRS and LAPD have recovered approximately $5 million from homes, cars and other valuables purchased by the group. In October of 1997, David Ghantt, a Loomis Fargo employee, left the office without securing the company vault or turning on the alarm. Later, $17.4 million went missing. Surveillance footage showed Ghantt loading money into a truck, which was later located with $3 million left inside. Ghantt was tracked to Mexico, where he was arrested. In November 2006, an international flight en route to Miami arrived with $80 million in cash for the Miami Federal Reserve. Masked men looted a warehouse that the money was transferred to before clearing customs. The men stole six bags of money totaling $7.4 million. Later, the conspirators were charged with armed robbery and approximately $1 million of the stolen money was dug up on one of their properties. In 1950, a Brinks van in Boston was robbed of over $1 million in cash and $1.5 million in checks and securities by a group of masked and armed men, the largest heist at the time. Eventually, the robbers were found and arrested, except for one who had died. Eight of the gang members were sentenced to life in prison and then paroled by 1971, except one who died in prison.